You specified: nokogiri (~> 1.7.2) and nokogiri (>= 0). Bundler cannot continue. 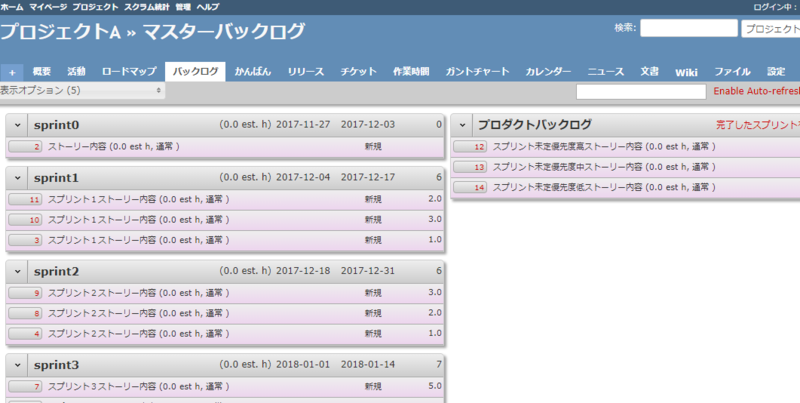 #gem "capybara" ... #gem "rspec"
gem install ZenTest -v "4.5.0"
gem install test-unit -v " 1.2.3"
gem install timecop -v " 0.3.5"
gem install rspec-expectations -v "3.5.0"
gem install loofah -v "2.1.1"
gem install globalid -v "0.4.1"
gem install mail -v "2.6.6"
gem install actionpack-xml_parser -v "1.0.2"
gem install css_parser -v "1.6.0"
gem install jquery-rails -v "3.1.4"
gem install protected_attributes -v "1.1.4"
gem install rack-openid -v "1.4.2"
gem install sprockets-rails -v "3.2.1"
gem install rbpdf -v "1.19.3"
gem install roadie -v "3.2.2"
gem install roadie-rails -v "1.1.1"
(in /opt/redmine-3.4.3-1/apps/redmine/htdocs) 3.4.3.stable. You are running backlogs v1.0.6, latest version is 1.0.6 ===================================================== Redmine Backlogs Installer ===================================================== Installing to the production environment. Fetching card labels from http://git.gnome.org...done! Configuring story and task trackers... ----------------------------------------------------- Which trackers do you want to use for your stories? 1. バグ 2. 機能 3. サポート Separate values with a space (e.g. 1 3): 1 You selected the following trackers: バグ. Is this correct? (y/n) y ----------------------------------------------------- Which tracker do you want to use for your tasks? 1. 機能 2. 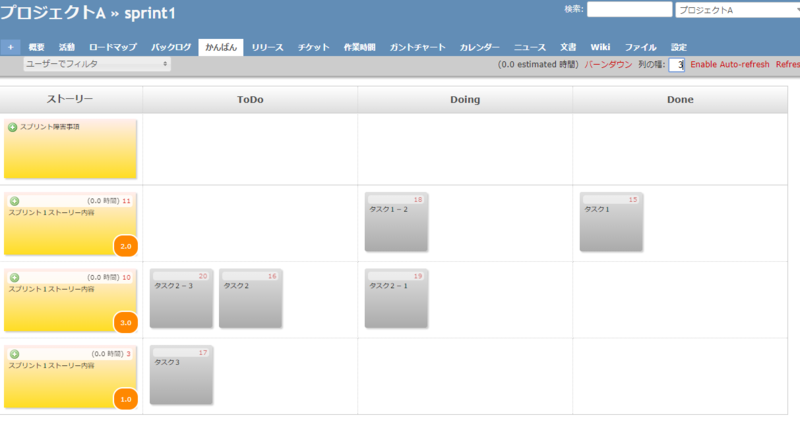 サポート Choose one from above (or choose none to create a new tracker): 1 You selected 機能. Is this correct? (y/n) y Story and task trackers are now set. Migrating the database...done! Installation complete. 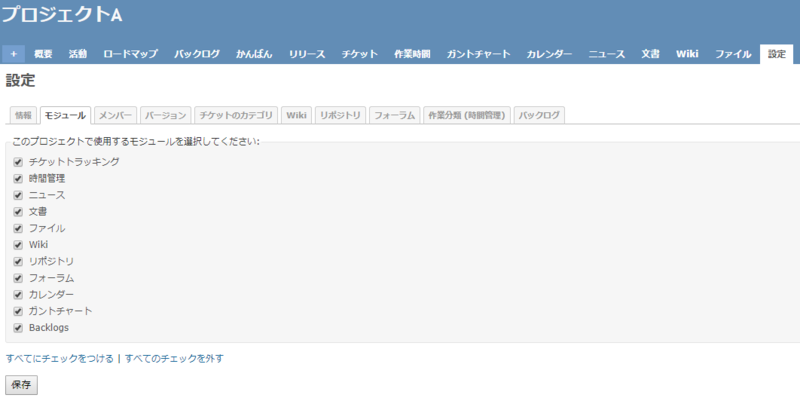 Please restart Redmine. Thank you for trying out Redmine Backlogs! Installing to the production environment. Fetching card labels from http://git.gnome.org...done! Which trackers do you want to use for your stories? Which tracker do you want to use for your tasks? Story and task trackers are now set. Installation complete. Please restart Redmine. 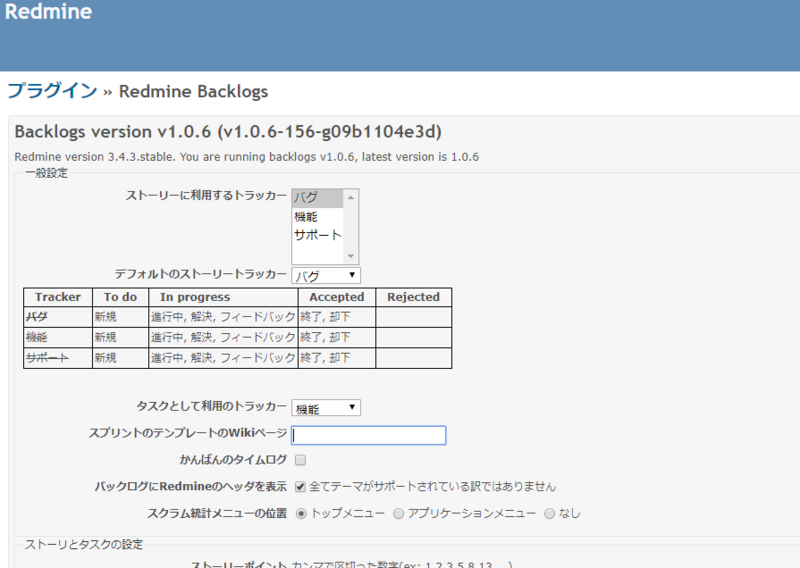 Thank you for trying out Redmine Backlogs!